What does the highlighted word say? What about this highlighted word? You are a reading genius! Wow!! You are actually a READING GENIUS!! 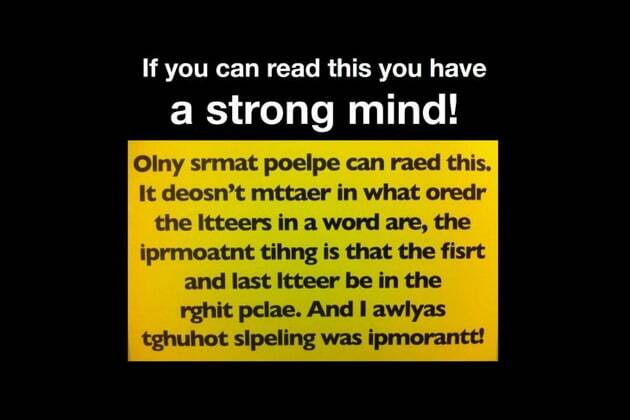 Your mind is so impressive that it can read anyway you look! It can even read sentences that contain mixed up words and sentences that are upside down!! Not to mention scrambled words and spotting the hidden words! You clearly have laser vision! You are almost a reading genius! Your brain is working in full force!! It is clearly determined to nail this reading quiz and it is so close to reading all the words correctly!! You only missed a few words but with some extra reading practice, your brain will be a word genius in no time!! Oh no! Your brain hasn't quite grasped the concept of reading in various ways! Not to fear!! This skill can definitely be mastered! Keep on exercising your brain muscles and you will be a word scrambling master in no time! !